My name is <name> and I am currently pursuing my <degree> in <major> from <institute>. I am well-versed with C/C++ and have started learning Java. I’m also learning about Android and iOS apps. I have good knowledge of HTML, CSS, JS too. If given chance, I’ll give my 100% at work. I am confident that I will be a valuable asset to your team. Seems like a decent email, however, there’s one major red flag about this application. The applicant is not talking anything about the startup he is applying to and how he will benefit them. This shows that the applicant has not researched about the company’s business and engineering. So, how to write an application email for Software Engineering Internships at startups? Try to address the right person in the company. When you begin with “Hi” or “Hey there” or “Sir/Ma’am” you’re diffusing the responsibility of a reply, a lot of emails are lost in the haystack because everybody in the group thinks that it is not meant for them or someone else will reply. Connect with someone in the company and ask them for the right person to contact for the purpose. Address them in your application email. Keep the subject line and introduction short. Begin with your name, major and institute. That’d be all. Next you should be talking about what you know about the company and how you both can benefit each other. Research about the company’s engineering. Many tech companies have engineering blogs. You’ll know what technologies they use. Now you have what technologies you should highlight in the application, only if you know them well. Check out the open source projects of the company. Every good tech company knows what engineering tasks they are going to accomplish in the upcoming year. You can contribute to their public repositories. And then highlight this in your application. Use the product or services offered by the company. Find all sorts of possible improvements and suggest solutions for them in your application email. Every user out there is pointing out problems to them via support tickets, so suggesting solutions for them is an important part. Sure that’s going to make your application a little longer than usual, however, it will make you stand out among the crowd. Ideally, such an application should be addressed to one of the engineers at the company. Terms like “I’ll be a good addition to the team”, “Fast learner” etc. are subjective in nature. You have to prove it objectively. This is why many companies have started giving away take-home projects. 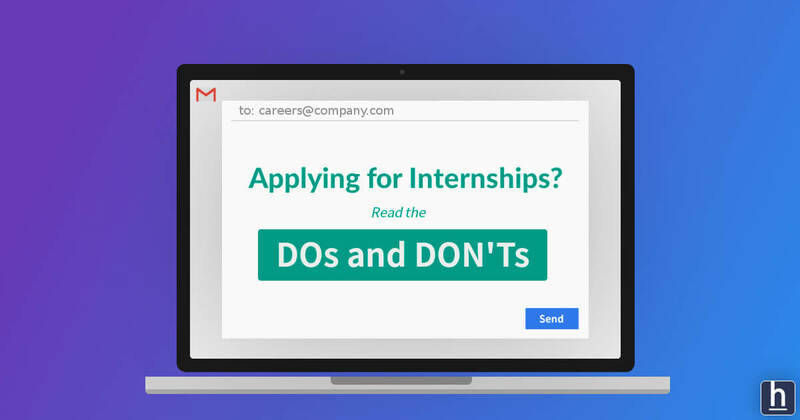 Candidates can work on it for a week and depending on the work accomplished, companies get a good idea of how the candidate will perform during the internship. Some companies think that the candidate can cheat by asking someone else to do the take-home project. So they keep the candidate for a week-long project on trial. To overcome all of this, you, as a candidate, can think of features or apps that you can build which could be of value to the company. You can also make use of any APIs exposed by the company. You can then highlight such contributions to the company in your application, which shows that you’re reliable because you have a good past record. LinkedIn and AngelList are extensively used by Talent Acquisition team because they are quite familiar with their profile format and features. A Github account with few repositories and regular commits helps you in two ways: It shows that 1. You know how to use git 2. You’re consistent at work. Engineers may check your code to judge you by its quality. You may also create a portfolio for yourself. You can extensively highlight all your projects in the portfolio. 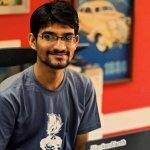 You can also write tech blog posts about challenges you faced during some project and how you solved them. By thy way, if you’re good at communication (written or verbal) you will do well in any job in the world. And your application email is one of the things by which every company is going to judge your communication skills. Lastly, prepare a short résumé that highlights your strengths and modify it for the target company. The resume format suggested by careercup seems adequate. However, it is suggested to apply your creativity to make it stand out. People don’t spend more than 30 seconds to go through any resume. Make sure you make those 30 seconds count. Don’t send blind emails in bulk in to or cc or bcc expecting at least one of them to respond. Target few companies and write personalized emails. Don’t write a subject line longer than 5-8 words. Don’t share your email format with your friend who is going to send the same email to the company by replacing a few things. You both will be rejected. Don’t mention all the technologies you know, a company is not interested in what you know, they are interested in what you know that they use. Do your research well. Don’t include subjective statements which cannot be proved like “I always give my 100%” and similar statements. Don’t send reminder emails on your application email frequently. Give it a week for them to respond. They receive hundreds of emails every day. Don’t say that “Review my CV and match it to open roles in your company”. It is candidate’s duty to target a particular position. The startup hiring process includes resume filtering, phone screening, face-to-face interviews (plus take-home projects in some cases) and final interview with founders. Many good candidates are not able to get past the first hurdle. To all those candidates, next time you apply for an internship, use this post as a checklist. All the best!